Protect your investment. We know how expensive quality glass is nowadays especially the target models we use in BPCR, Benchrest, Schuetzen, etc. 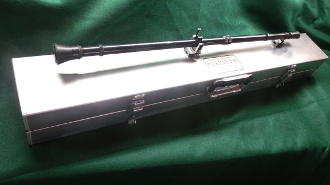 You really need a very safe place to store and protect your target scope and I’ve come across the finest case I’ve ever seen, the M&B Scope Box. The M&B sports high grade aircraft aluminum construction, a foam lid seal, a heavy duty spring loaded handle that folds out of the way, a no fail piano hinge for the lid, heavy duty lid latches, and welded corners to complete the vault like protection. At first, you might think this case is expensive. The only answer for this is the question of how much did you pay for the scope? You will not regret buying the best protection for your scope. OAL is 36 inches and will take scopes up to 34.5 inches in length. MADE IN THE USA.